Made by King, Henry in Sydney, New South Wales, Australia, 1892-1900. 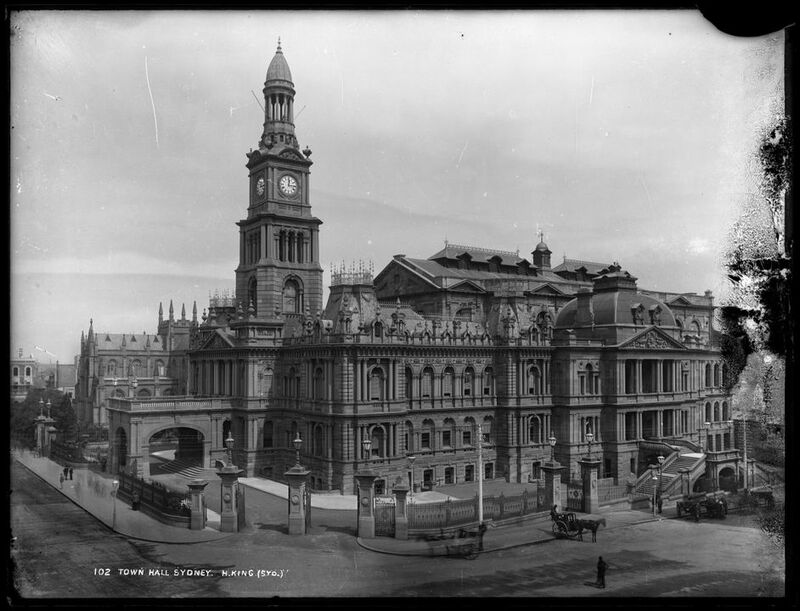 This image shows Sydney Town Hall which was built between 1868 and 1889 from the corner of George and Druitt Streets. Various architects were involved over the course of its construction, including George McRae, who was responsible for the Queen Victoria Building. The ornate high Victorian Second Empire Style reflected the affluence and confidence of the booming city of the time. When finished the Town Hall’s Clock Tower was the tallest structure in the city. Glass negative, full plate, 'Town Hall, Sydney', Henry King, Sydney, Australia, c. 1880-1900.